The HCX Advanced is a pluggable microprocessor hybrid controller that provides monitoring and control for a broad range of UNIPOWER Hybrid Power Systems. The HCX Advanced provides optimum battery cycling, generator management and renewable energy source prioritization. The HCX Advanced hybrid controller also monitors all system parameters including: DC voltage, rectifier current, rectifier temperature, system capacity, battery parameters, and circuit breaker status with capacity to monitor additional external analog or digital inputs. Alarm and warning notifications are indicated by front panel LEDs, and through potential free alarm contacts that allow remote signalling. 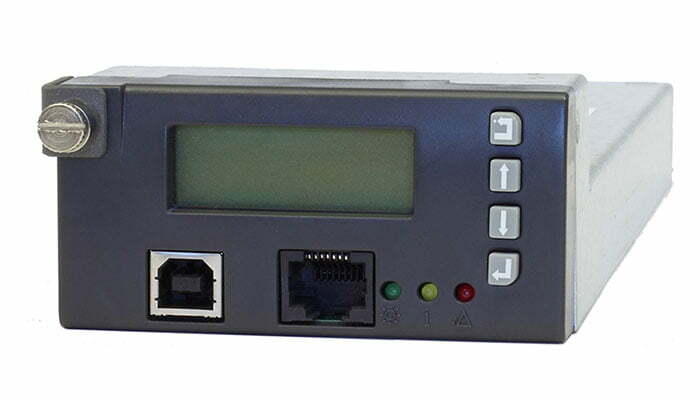 External monitoring of alarms and statistical data is accomplished through a USB connection using PC based PowCom™ software. Remote management is provided through an Ethernet port allowing control over a TCP/IP network and includes web based support. Alarms can be mapped via SNMP traps to customer OSS platforms such as HP Openview™. The HCX Advanced’s straightforward LCD menu or local/remote software configuration tool allows for ease of commissioning to meet a wide range of applications and supporting number battery and energy sources. The HCX Advanced hybrid controller contains a Programmable Logic Unit that can be used to monitor and control additional site data such as fuel level/flow and environmental measurements. This allows individual alarm routing and logic operations to be set as actions, alarms to be triggered, and outputs to be activated based on internal and external signal monitoring, comparing, and processing. External Communication USB interface for control from a PC with PowCom™ sotware. Ethernet interface allowing monitoring and control over a TCP/IP network. Web browser support + SNMPv2c. Site Logs System tools developed to assist site management.